After a few considerations - I decided to delay the Village to Town system for later on - most likely October. 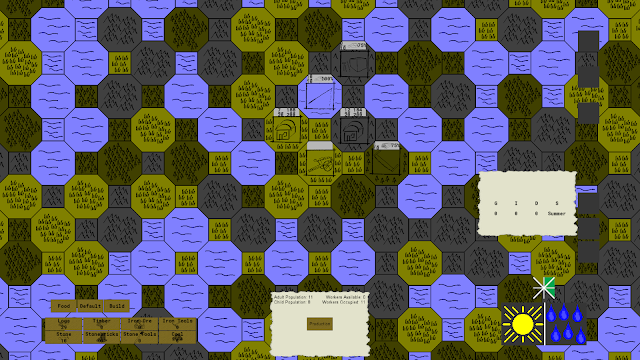 The reason for this decision was that implementing the up-scaled graphics, together with a few other related features; much of the game's code has to be modified to ensure it functions with the larger tile size. For this choice - I decided before moving onto another major feature that would require essentially braking down the game's functionality again until implemented - I would like to have another play-test to ensure that most of the game's systems remain functional; and no hidden bugs crop up. That being said - with the end of the month nearing - I decided to focus on adding more content to the game itself. Based on the feedback from the first play-test - there was a high request for more approaches to deal with issues in-game, be they resources or structures. Whilst the game is early on - and content is a relatively low in importance compared to getting the game's functionality down - with around a week left in this development cycle, I decided it would be worth dedicating some more time to adding this content to begin trying it out and testing it. Balancing will definitely be a continuous process - as will be changing around structures until they both fit in a logical manner - and fit with the still-evolving game's functionality. It is - needless to say - imperative to maintain a type of general approach to various game systems, to allow room for changes in the way the game works. Such as making sure that if down the road - structures do need to be placed adjacent to one another - the code to build structures is easily modified to allow for this restriction. Another system being added is an Event Notification system. Players during the play-test of the Pre-Alpha 0.1 Build expressed their wishes to be notified of certain events; and this feature had already been planned to be implemented - and it has found it's way into this build. At this stage - the system is very much a place-holder in terms of it's graphical and also in terms of it's ability to convey information. Players receive a weekly report of Growths, Immigration, Decline in the Population, and also the change in season. Aside from this - players are also notified if a Residential District is running low on food - and they also can move the camera to the related district by simply clicking on the notification. For the moment - a small icon falls from the top right of the screen - and the player can hover over the icon to display the related information. It is, needless to say, planned to ensure each icon is distinguishable for various events - and also allow for a cleaner and quicker way to relay the information within the tool-tip. The last week has not been very productive for a number of reasons - between other obligations and similar reasons; as such I used it to stream-line a few processes to make future work simpler and easier. For example - I organised the sprite and image files I use for the tiles and structures within Krita - the software I am currently trying out to use for graphic creation - in layers in a way that will make it easier to create new structures, export it's relevant images, and import them into Game Maker Studio in as few steps as possible. I have been thinking a lot about a major change I want to implement in the way that towns are built. Previously - players simply built districts that perform various functionality such as housing the population or refining material into other resources. 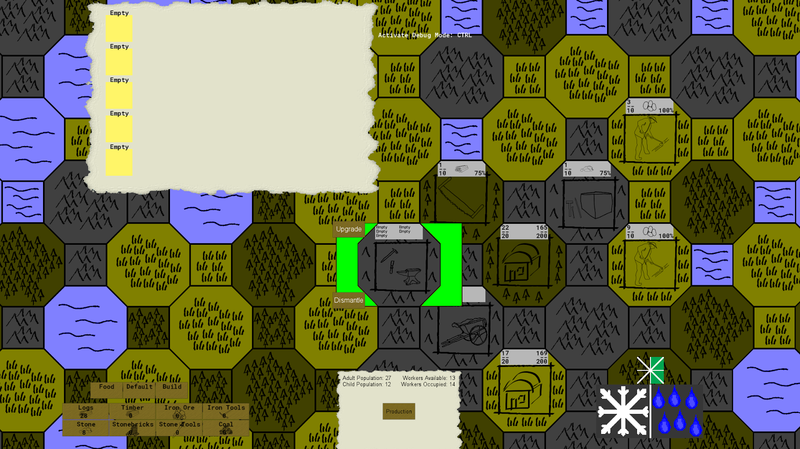 This was always meant to change - and I have been taking steps into figuring out how to implement the early stages of the player's civilisation building with village, that will eventually lead to the creation of towns, and their subsequent expansion using districts. As it stands - players will begin by constructing villages which will be a amalgamation of the current existing Residential, Mercantile and Artisan districts. Once a village reaches around 100 population - it can expand into a town. Expanding into a town changes the village tile into a Capital District - and also unlocks the ability to build the various other districts adjacent to it. In a way - this gives towns a more later game feel, and also provide a more authentic way of growing and developing - rather than what is usually done where the player creates the structures when, and where they might fit. This will require more planning by the player - since the districts will need to be built adjacent to one another - and it is a possibility that a bad placement in the early game of a village could mean that the town will be smaller in size, and will require the player to build an extra village to expand instead. On that note - it is worth mentioning that the player will be able to build more villages which themselves will expand into other towns - I have yet to decide how to handle interaction between the various towns that a player might possibly decide to create. This will be a fairly major feature of the next test-build, which I hope to have completed before the planned play-test date. The last week has been focused on something which I've been meaning to do for a while. Previously the sizes of the map tiles were around 200 x 200 pixels. As such - all UI elements were designed with this in mind. This size made it difficult to put certain detail into the art of the game, and as such - I've been meaning to scale it up to a larger amount - a tile is now 800 x 800 pixels. This has meant that the UI needs to also be scaled up in size, to match the new tile sizes as the camera is further zoomed outward. Since I was working with the scaling - I decided to put in Zooming once more; since this feature was planned to be in the game - which I decided to put on the backlog for a while. Now re-added - my goal the past week was to ensure that if I decided to scale up the tiles once more - I wouldn't have the issue to re-adjust the size of the UI again. After a few days of working out the mathematics of it - it's working quite well! The system essentially increases the scale of the sprite of the UI element, whilst also maintaining it's position on the screen. This was done by using variables containing the distance from the centre of the screen where the camera is centred, and then using percentages to position the elements on the screen. As long as the scale of the image was correct - the element will remain in place whenever you zoom out. This has - of course - meant that I have a day or two of going through various UI elements and adjusting the code that positions and determines their scale. However once that's done, everything should be in working order and future proofed to deal with this automatically if I decided to upscale the tiles again! Game Maker Progress 45: What's next? The next development cycle is under-way - the next play-test currently planned for the end of August. Due to the shorter cycle this time around - the feature list includes far less time-heavy work; and will instead of focus on fine-tuning the issues with the core game-play loop. One of the major changes will be moving towards a new way to build your nation - starting with villages, and expanding into larger cities with districts. This has a two-pronged benefit - the first being it eases the player into the growth, requirements and expansion of larger cities, and it also provides a more believable feel to the way the nation expands and grows. Together with this - new structures will be added, together with new resources, all to help encourage a different approach to solving various problems faced within the game, and also tackle new obstacles. Warmth and health are both planned to be within this next build. Simplistic versions of the larger systems - but it will help gauge the effect of these systems on the game itself, until slowly expanding them to become more enticing and engaging, in relation to planning and consequence. Nation Traits - one of the features which has been planned from the very start - will also begin to be implemented. Nation Traits can be seen as the nation's general understanding of a particular field. As Farming is done more and more in the nation, your people will learn more about farming - unlocking new benefits, structures and ideas. This will help give both a feeling of progression - as well as an indication that the new budding nation is finding it's footing in it's new land. That more or less tackles the more in-depth and complicated features that might give rise to unexpected issues. Some are prioritised over others - however, they should all fit within the allotted time-frame. Finally - a number of less work-load intensive, more convenient features are planned - such as the ability to view the composition of the workforce in a menu to know how many people are doing what - to an event tracker which will help inform the player of any issues that might be arising, or any events of note. Much of what's been decided has been based on the feedback generated from the play-test - it was both a motivating and highly insightful experience, which I plan on hopefully replicating more and more as the game progresses forward. Yesterday - the first group play-test of Foundation of Civilisation took place. Whilst the game is still heavily in development, the first feedback was both promising and insightful! I was a little bit nervous - as I think many people tend to be when showing of their new work; especially when it is of personal importance. The overall response to the game was positive - the game in it's limited state shows promise to being a fairly enjoyable game to play. Before-hand, I'd like to take this opportunity to, again, thank the play-testers for their support and willingness to help try the game at this incomplete state - which I am confident will help make it a far better experience as a game! A small informal survey at the end of the play-test helps shed some light on how the play-test went. The results will now be used to help plan what needs to improve, what needs to change, what is highly requested to be added next, and where there is interest. Needless to say - this was a small play-test of around 6 individuals, so the size of the sample is limited - but it remains useful none-the-less. When asked about what they'd like to see in the game, the suggestions and ideas were highly varied. Ideas ranging from different types of events to help cause disruptions to the game, which would make planning more critical, to tools that would aid in planning, and controlling the nation itself. Many of these suggestions will likely find themselves in the already planned out systems, to perhaps even being added to the list of features to be added in the future! The next week will involve planning what to add and test in the next prototype build - which I am hoping to schedule at the end of August. Needless to say, due to the shorter cycle [For the first prototype, it was a 2 month cycle] - less features will be added, and the focus will likely be on both refining what already exists, and adding new features that are planned out for testing. Thank you for reading through this if you have, and thank you for the play-testers who participated in this play-test!